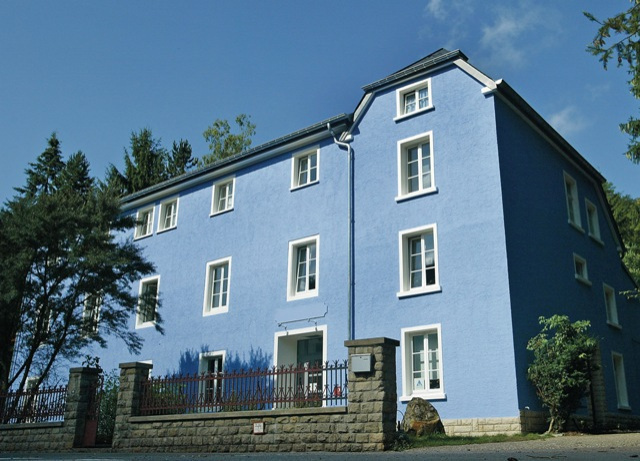 The youth hostel Larochette offers family- and group-friendly bungalows for an active holiday or comfortable double rooms for tourists looking for an adventurous experiences in the Mullerthal Region – Luxembourg’s Little Switzerland. Larochette is also referred to as ‘Fels’ (rock) in German, and the name says it all. The village’s main attraction is its majestic castle ruin, perched upon a rock and overlooking the valley of the White Ernz river, the heart of the Mullerthal Region – Luxembourg’s Little Switzerland. This region’s picturesque charm is reflected in the cosy youth hostel of Larochette. Located near the centre of the village with its historical market place, the youth hostel provides bright, comfortable double rooms and affordable group accommodation in bungalows and a large chalet. 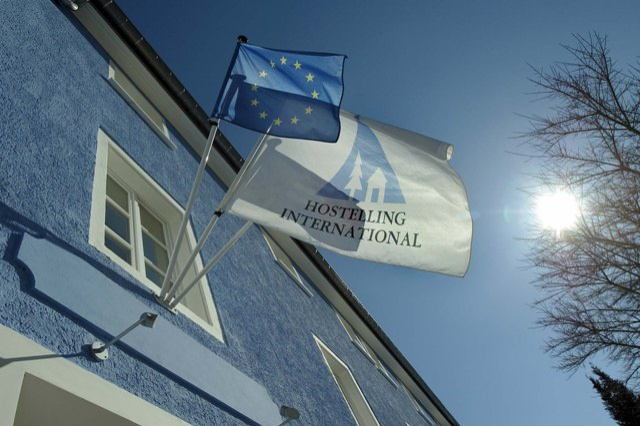 While the hostel is an ideal starting point for hiking, exploring, cycling or mountain biking, it also provides many opportunities for resting and relaxation. Numerous activities are proposed for backpackers, families and groups of all ages. Or you may simply let your soul drift and enjoy your free time. Furthermore, the youth hostel is equipped with a conference room and a common room with a fireplace as well as a play corner for children. The in-house ‘Melting Pot’, the in-house restaurant has a large terrace and serves local and seasonal dishes of the day as well as ‘à la carte’ options. Nature lovers may stroll through the park, located behind the youth hostel, and enjoy the charm of the small village during their holiday experience. The bus stop ‘Leedebach’ is located directly on the main street in Larochette, only 100 metres away from the youth hostel. You can travel by train from Luxembourg-City to Ettelbruck and take the bus 507 (Diekirch/Ettelbruck-Grevenmacher), which stops at ‘Leedebach’. Following bus lines also travel to Larochette: 100 (Luxemburg-Larochette-Diekirch), 409 (Mersch-Larochette-Stegen), 504 (Ettelbruck-Haller), 848 (Echternach-Colmar/Usines). Arriving from Cologne/Bitburg on the A64/B51, take the B257/E29 to Irrel and continue to Echternach. In Echternacherbruck, take the bridge across the border in order to arrive in Echternach and continue on the N11/CR364 towards Lauterborn. Pass through Consdorf on the CR118 and drive direction Christnach before arriving in Larochette. Turn onto the N14. 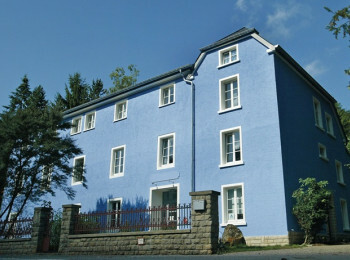 The youth hostel is situated on your left at the village exit in a small side street. Arriving from Brussels on the E25/A6, you take the exit Mamer/Capellen. You then follow the CR102 until Mersch and take the CR118 through Angelsberg to Larochette. Turn onto the N14. The youth hostel is situated on your left side at the village exit in a small side street. Arriving from Sarrebruck/Metz/Luxembourg, continue in direction of Trier on the A1 and change to the A7 in direction of Ettelbruck. Take the first exit Waldhof and continue on the E29/N11 in direction of Junglinster/Echternach. Drive through Junglinster and turn onto the CR121 in direction of Blumenthal. Follow the N14 through Reuland and Heffingen to Larochette. 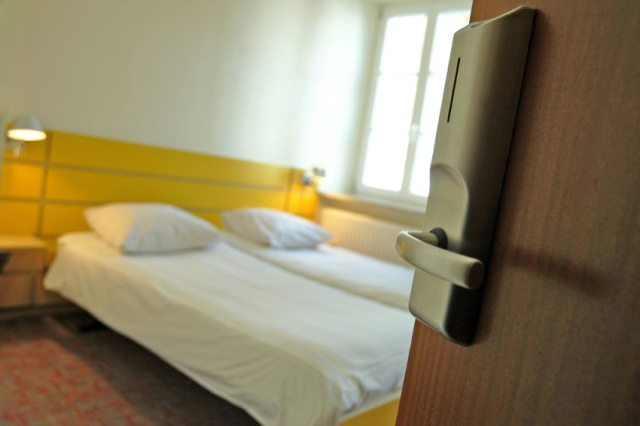 The youth hostel is situated on your left at the village exit in a small side street. 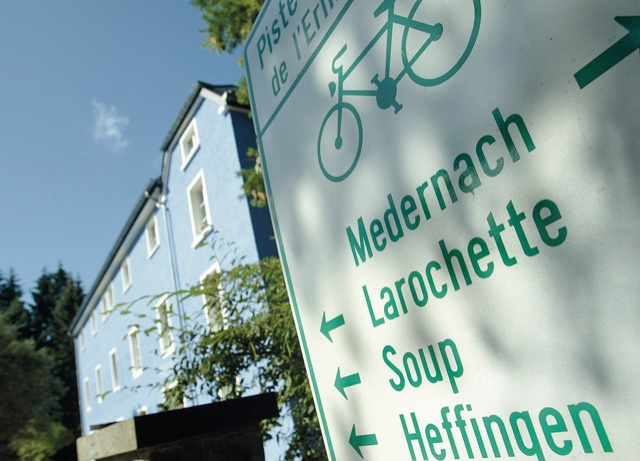 The youth hostel Larochette is located directly on the cycle path PC 5. Coming from Luxembourg-City or Echternach, take the PC 2 to Junglinster. Take the CR129 to Godbrange and follow the CR130 through Schlitzberg to the departing point of the cycle path PC 5 in order to arrive in Larochette. Coming from Ettelbruck/Diekirch, follow the PC 16 to Reisdorf. If you are arriving from Vianden, follow the PC 3 to Reisdorf. From there, follow the CR358 through the Valley of the White Ernz to Medernach. There you take the PC 5 to Larochette. 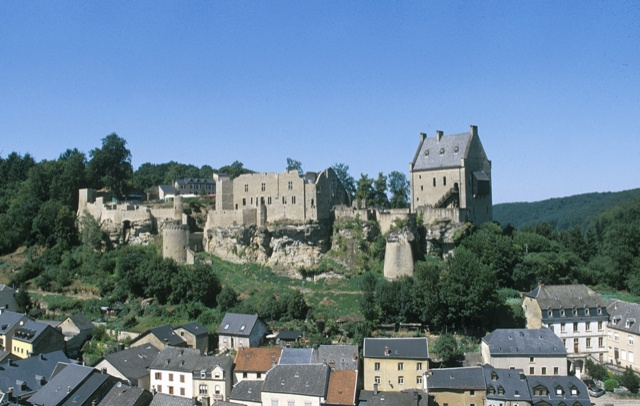 Village, forest, castle, river – these are the four words describing Larochette. The castle ruins, towering over the Valley of the White Ernz and the picturesque market place transform this small village into a charming retreat worth a visit. Even Victor Hugo stayed in Larochette. Hiking, cycling or just resting – everything can be done here. 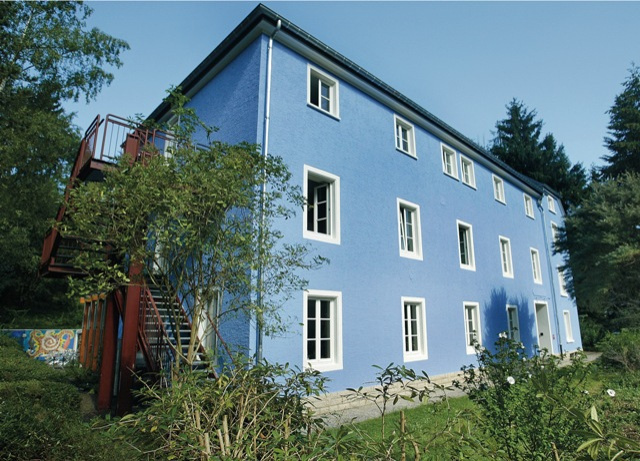 The youth hostel Larochette is located in the Mullerthal Region – Luxembourg’s Little Switzerland, in the middle of one of the most beautiful areas of Luxembourg. Do you want to boost the team spirit of your class or group, have some fun while learning something new or just get far away from the daily grind? The possibilities are numerous. The youth hostel Larochette offers a large range of activities for young and old. Who would like to go on a treasure hunt and learn how to use the GPS or discover the life of the knights in the castle during medieval times in Larochette? Other activities in Larochette are hiking and mountain bike tours as well as frisbee golf. Dense forests, legendary rocks and a castle, presiding over the valley of the White Ernz – Larochette is a real paradise for hikers. The village, located in the heart of the well-known Mullerthal Region – Luxembourg’s Little Switzerland with its Mullerthal Trail offers a large variety of hiking tours. You may hike individually or in a group with a guide. Hiking trip: The Mullerthal Trail Route 3 as well as the ExtraTour A start only a few metres from the youth hostel just like numerous national trails and local walking paths. If you like discovering the region on your bike, Larochette is the perfect starting point for your trips. The 23 national cycle paths in Luxembourg criss-cross the country from the North to the South. The national cycle paths PC 2 Echternach, PC 3 des Trois Rivières, PC 5 de l’Ernz Blanche. PC 15 de l’Alzette and PC 16 de la Moyenne Sûre are nearby the ‘Bed & Bike’ certified youth hostel. The youth hostel Larochette is a perfect departing point for athletes. Would you like to discover the region on your mountain bike? Not a problem. You can take a tour on your own or join a group with a guide. MTB Discovery: Stay overnight in Larochette and explore the spectacular rocky landscape on your mountain bike. The Mullerthal Region – Luxembourg’s Little Switzerland is a real treat for race bike fans. But a tour through the small villages around Larochette is also very sporty. As a birthday comes but once a year, the party for your child should be unique. 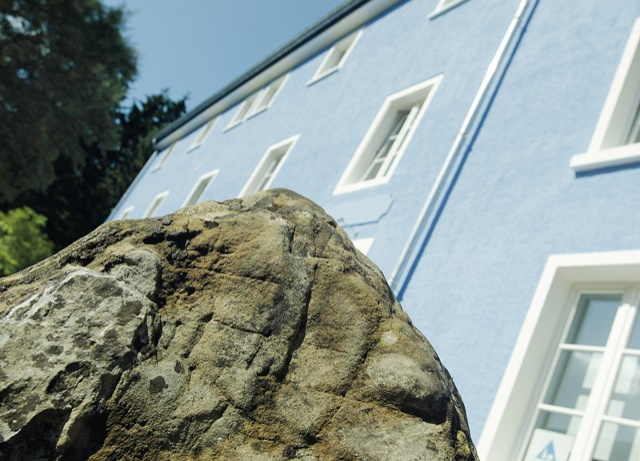 The youth hostel Larochette offers an all-round package with plenty of space and a wide range of activities and of course a delicious birthday cake. Rent & Play on your own: Rent a bouncing castle or a hifi-system for your child’s special day. 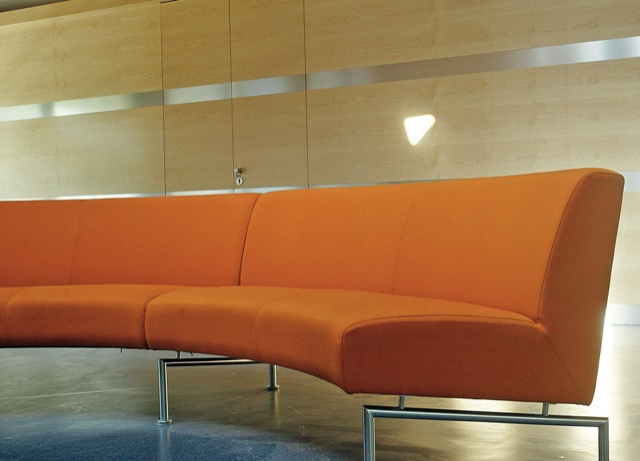 For a seminar to be successful and stress-free, you need the right location. 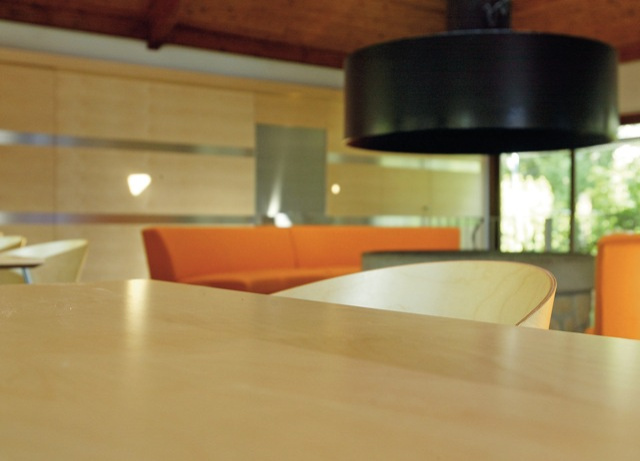 Why not book the fully equipped conference room at the youth hostel Larochette for your firm, organisation, group or class and enjoy a day in nature with a view of the medieval castle. 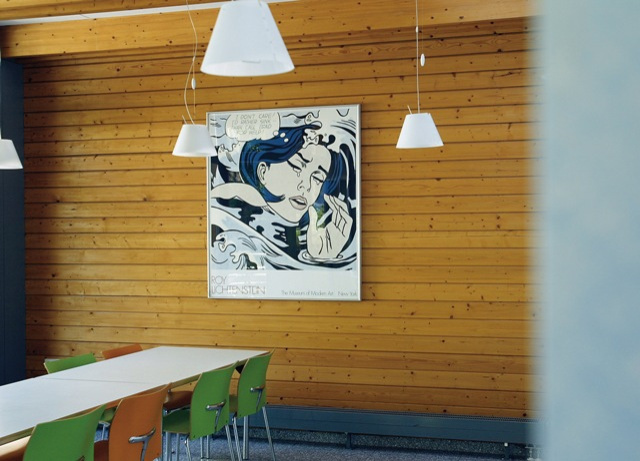 Regional, seasonal and fair meals are served in the youth hostel’s restaurant ‘Melting Pot’ in Larochette, from daily dishes to ‘à la carte’. Special dishes for children and vegetarians are on the menu. Tourists as well as residents are welcome to enjoy an affordable meal here at lunch or dinner time on every day of the week on reservation. The restaurant and its terrace are located on the ground floor of the main building and can accommodate 70 persons. Tourist groups may choose between the many offerings of the catering brochure. Are you looking for the right location for a birthday celebration, a family gathering or a corporate event? The kitchen staff will gladly put together a personal menu for you and your guests and the restaurant ‘Melting Pot’ can accommodate large groups.